You Be The Chemist inspires students, engages educators, and strengthens communities to build a better world through the science of chemistry. You Be The Chemist is building the future workforce by celebrating the role of science and chemistry in everyday learning and life. The signature You Be The Chemist programs uniquely connect business and education in local communities, to reach students early in life and ignite a passion for chemistry and science-related careers. You Be The Chemist Activity Guides use common, inexpensive items so educators can provide hands-on learning for K-8 students to explore foundational science concepts. Hands-on learning engages young children in exploring science. 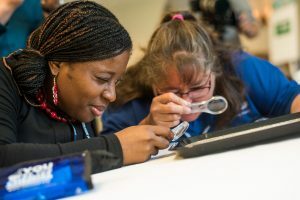 These activities make real-world connections for students to see the value of science and chemistry in everyday learning and life. 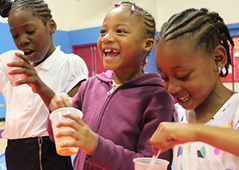 Since no formal lab space is needed, these experiments, lesson sheets, and supplemental resources are ready-to-use in schools, afterschool programs, camps, museums – anywhere! The content is compatible with the Next Generation Science Standards. Confidence. 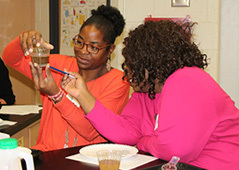 It’s what educators have after participating in You Be The Chemist Essential Elements professional development workshops, so they are equipped to lead hands-on science activities with students. This confidence is critical, and comes with providing K–8 educators—our “essential elements” in education—with methods for teaching chemistry concepts. 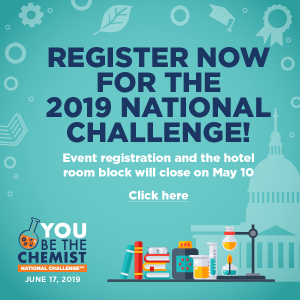 The Challenge program is an academic competition for students in grades 5-8, when most U.S. students have not studied chemistry as its own subject. Through celebrating and elevating the science of chemistry, we are inspiring students to further study and work in related fields. Since 2004, a National Challenge has been the culmination of local and state Challenges nationwide. Join us in celebrating and elevating the science of chemistry in learning and life! 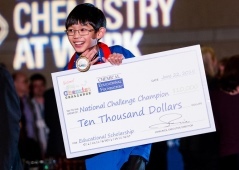 School registration for the 15th annual You Be The Chemist Challenge is now open!